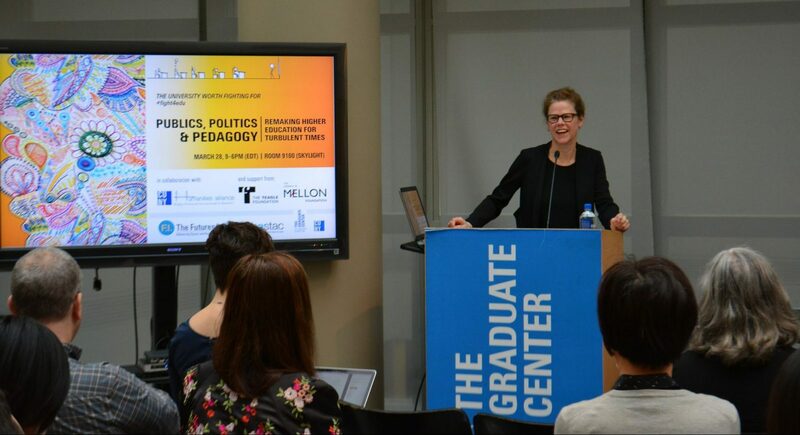 On Wednesday, March 28, 2018, the Futures Initiative hosted a daylong forum on “Publics, Politics, and Pedagogy: Remaking Higher Education for Turbulent Times.” Part of our University Worth Fighting For series, this event was an occasion to foster interdisciplinary conversation on the relationship between pedagogy, equity, and institutional change. 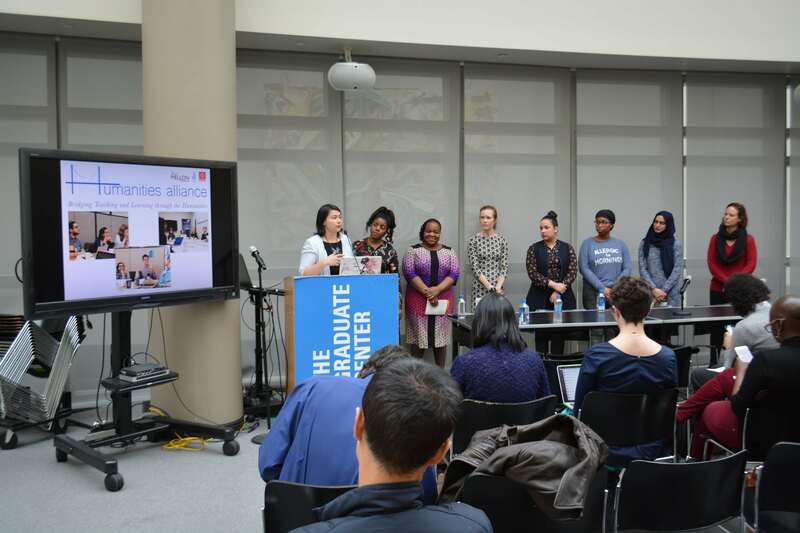 It was also an opportunity for the people involved in the many areas of our program--from our graduate fellows and the students and faculty involved in F.I. 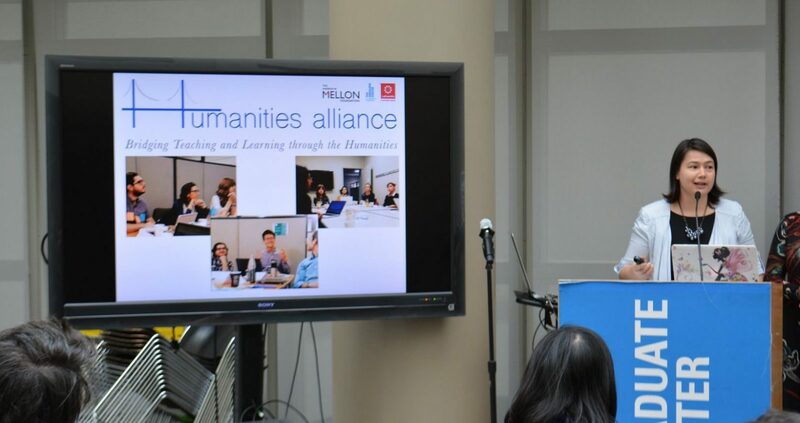 team-taught courses to our undergraduate leadership fellows and colleagues in the Humanities Alliance--to share their knowledge and experiences in a public setting, to engage precisely the different publics our work serves. 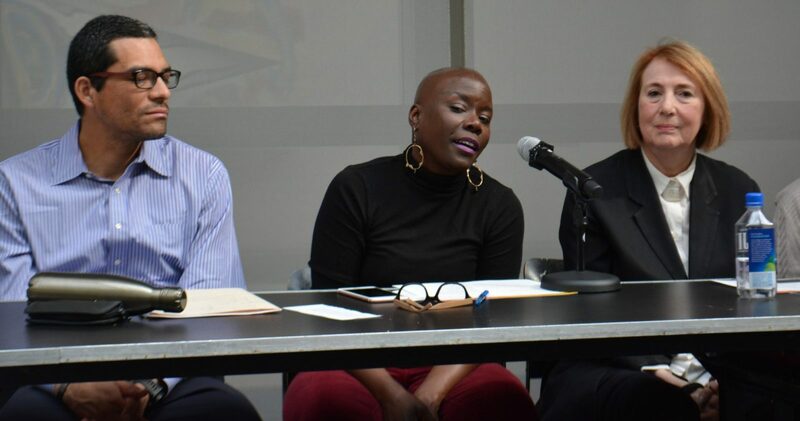 We were joined by faculty, staff, students, administrators, and activists both in person and online (via Twitter and livestream) from across CUNY, New York City, and beyond. 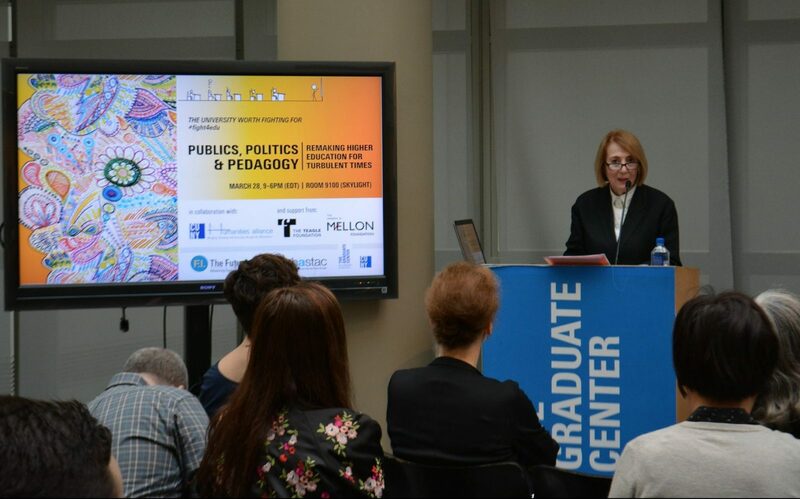 During the event, we collectively contemplated the current state and stakes of higher education, the challenges of being both a teacher and student in today’s turbulent sociopolitical climate, and the possibilities that might arise from and through our pedagogy, creative work, political commitments, and public encounters, which the day’s activities and conversations only affirmed are not separate endeavors. 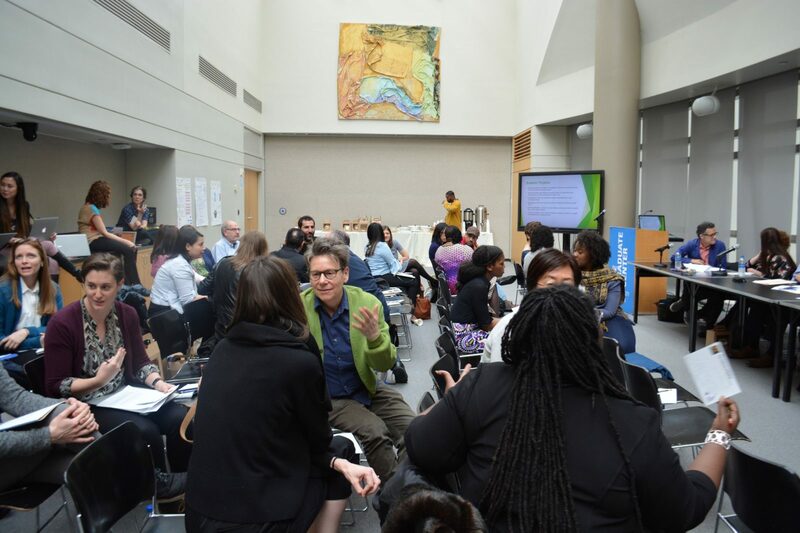 It was a pleasure for me to shape this event and then to watch it unfold, to listen and learn from old and new allies, and to revel in the ways that the Futures Initiative’s mission to advance innovation and equity in higher education resonated across the dialogues, workshops, presentations, and bodies assembled in the room. Below you will find a more detailed recap of the forum. 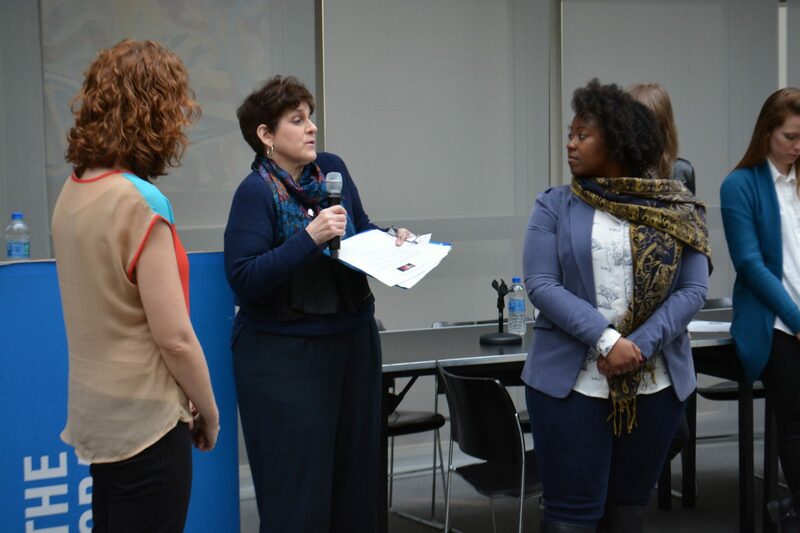 Founding Director, Cathy N. Davidson kicked off the day’s events with a warm welcome to all those present. 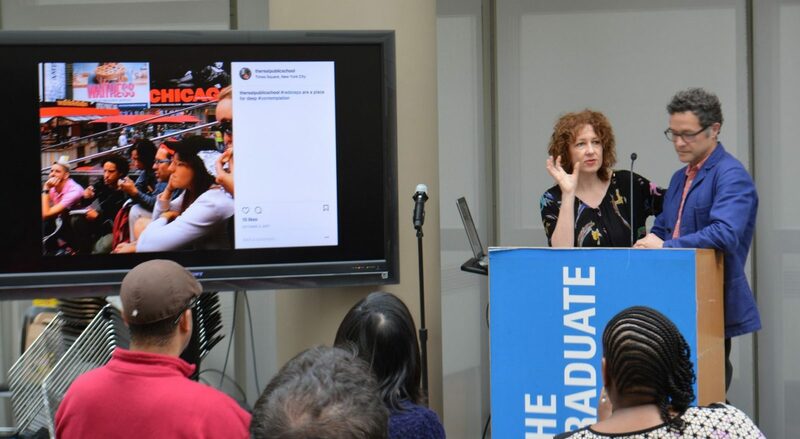 To illustrate the mission and core values of the Futures Initiative, she shared an anecdote about Samuel R. Delany’s first experience teaching a college course and the All-Hands-Raised activity he devised to combat the violence of silence in the classroom. 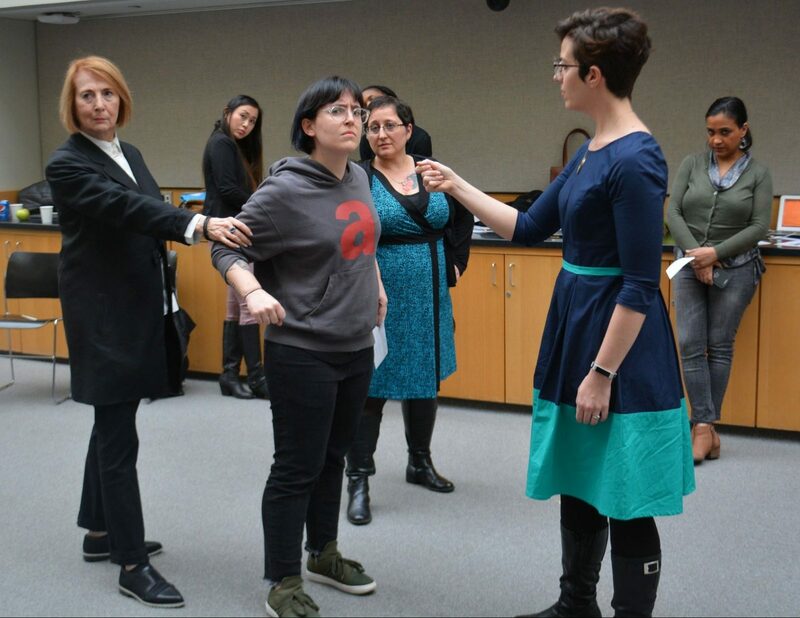 You can read her blog describing this incredible teaching method, including Delany’s own words about the motivation behind this exercise, on the HASTAC website. 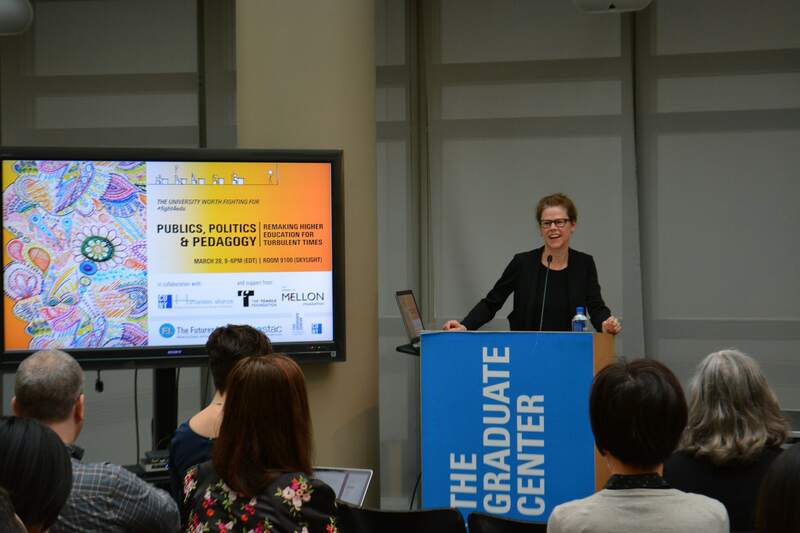 Davidson also expressed the program’s deep gratitude for the continued support of the GC Provost’s Office, CUNY Central, the Andrew W. Mellon Foundation, the CUNY Humanities Alliance, the Teagle Foundation, HASTAC, and the many many students, staff members, and faculty who helped make this event and the work of the Futures Initiative possible. Davidson then introduced Provost Joy Connolly. Provost Connolly’s opening remarks captured the extraordinary accomplishments of the Futures Initiative, which is now in its fourth year. 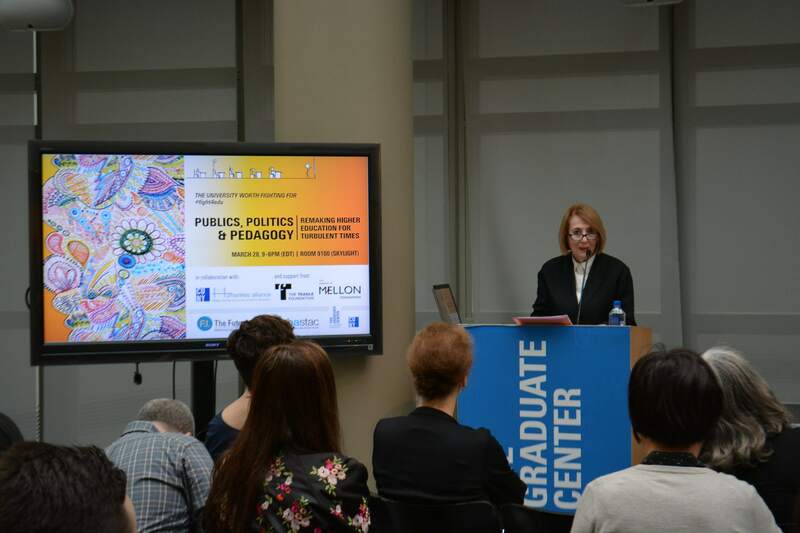 In particular, she noted how the program has risen to the challenge of not only doing interdisciplinary but inter-institutional work, through its team-taught courses and undergraduate leadership program, which reaches across the sprawling CUNY system. The Provost closed her remarks with an anecdote of her own. She described the frustrating questions she often receives from skeptics about the purpose (read: usefulness/ marketability) of doctoral education today, given the competitive nature of the job market. The responses she shared with us about how doctoral education trains specialists to be generalists, to engage in the project of understanding the world together--people capable of adapting to new, unpredictable environments, who are guided at every step by ideas and imagination, and who are willing to embrace impurity and innovation in a world that is complex, pluralistic, and often irrational--provided an invigorating introduction to the day. 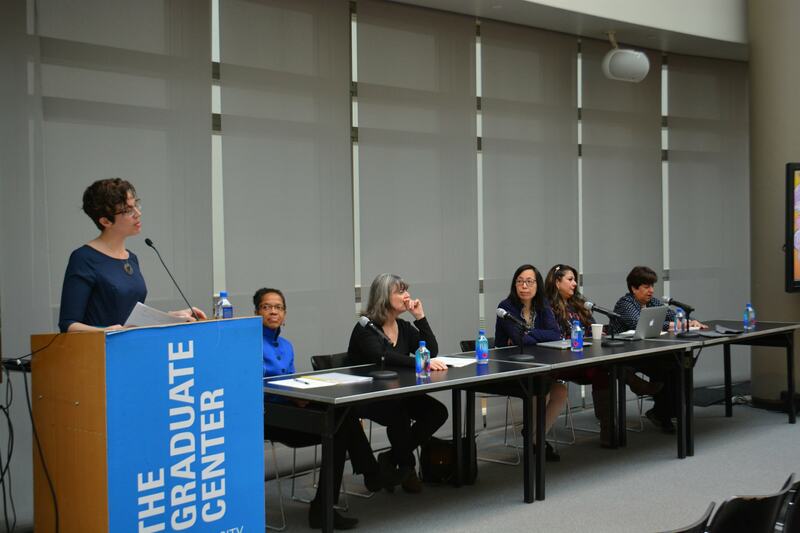 This faculty roundtable featured Gilda Barabino, who co-taught with Ann Kirschner, “Rethinking Higher Education for the Knowledge Economy,” Ofelia García and Rosario Torres-Guevara, who collaborated on the course, “Participatory Action Research in the Borderlands: Research and Pedagogy for the Americas,” and Ruth Milkman and Katherine Chen, who are co-teaching “Change and Crisis in Universities: Research, Education, and Equity in Uncertain Times” this spring. 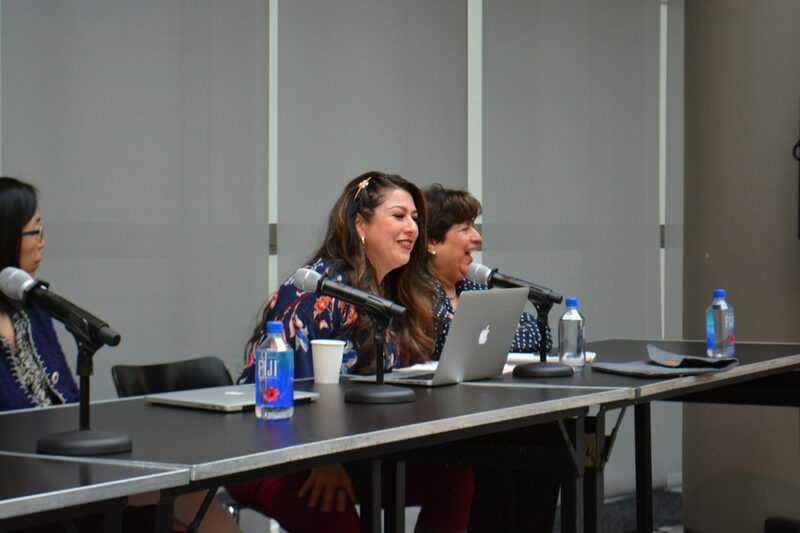 The faculty were joined by two graduate students, Sylvia Beltran and Michelle Gabay, from “Rethinking Higher Education” who shared their reflections as students in the class and led the Q&A session. 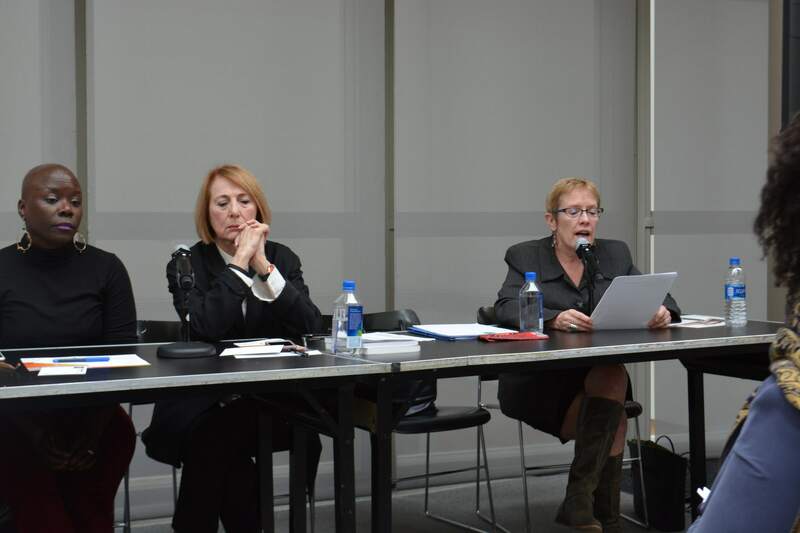 The panel was moderated by Katina Rogers, F.I. Director of Programs and Administration. What is the university? What is the role of the university? Who does the university serve? 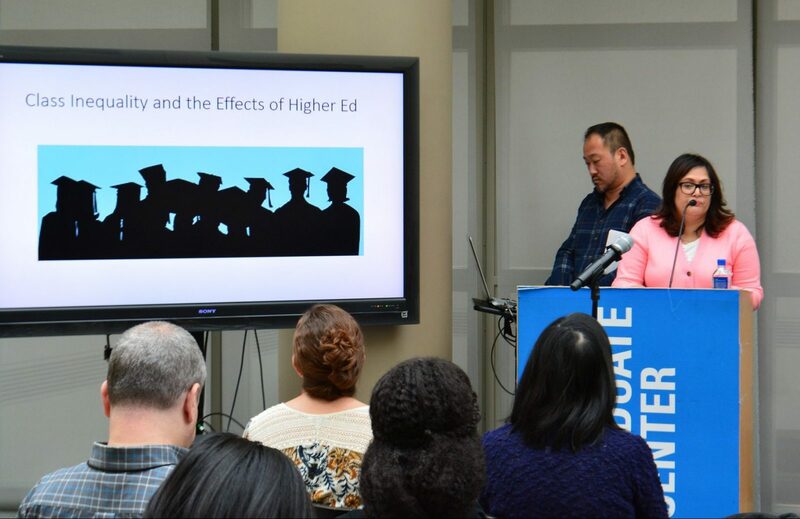 How do political, economic, and global forces impact student learning, especially somewhere like CUNY? 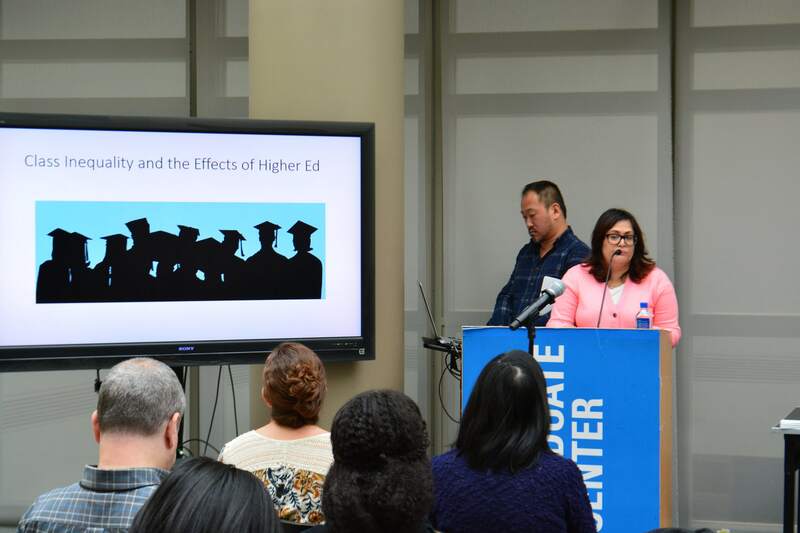 What would an equitable system of higher education look like? What could be done differently? 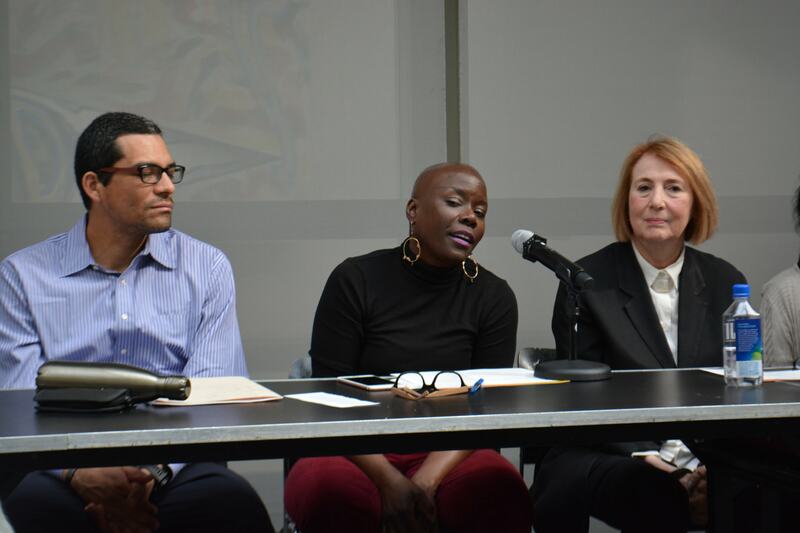 Rosario Torres-Guevara (center) shares her thoughts on the importance of Participatory Action Research as a bridge between the classroom and the community. Gilda Barabino answers an audience member's question about the problem of retaining diverse faculty in the academy: "We spend so much attention on how do we fix that person and make that person fit more when we should be spending even more attention on how do we fix the systems and cultures and the environments so that people as they do come in they will actually be retained." This session featured students from the following F.I. 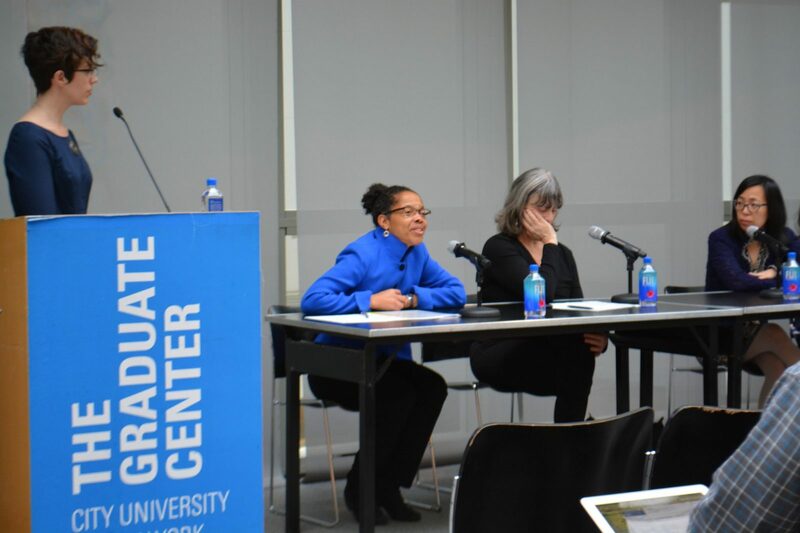 team-taught courses: “Change and Crisis in Universities,” “Rethinking Higher Education for the Knowledge Economy,” and “Participatory Action Research in the Borderlands.” The panel was moderated by F.I. Graduate Fellows Christina Katopodis, Michelle Morales, and Mike Rifino. 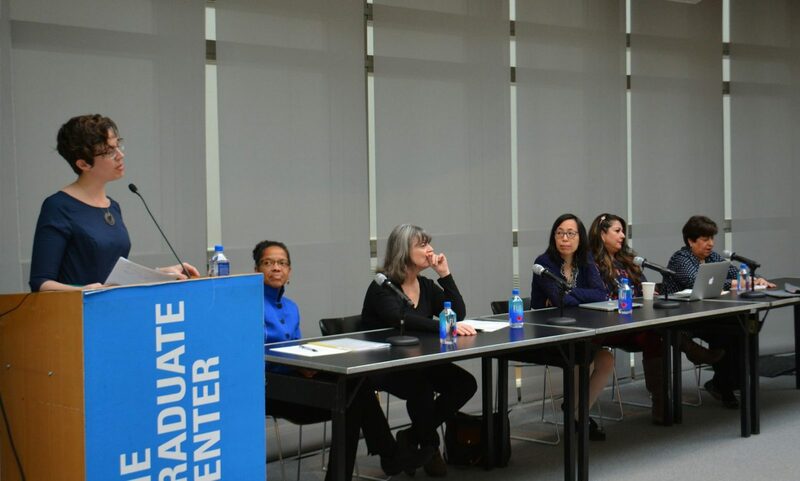 After the moderators led the audience in an interactive activity where we all wrote down three words describing learning, knowledge, and the university, the graduate students shared their initial expectations and experiences of participating in these co-taught classes. 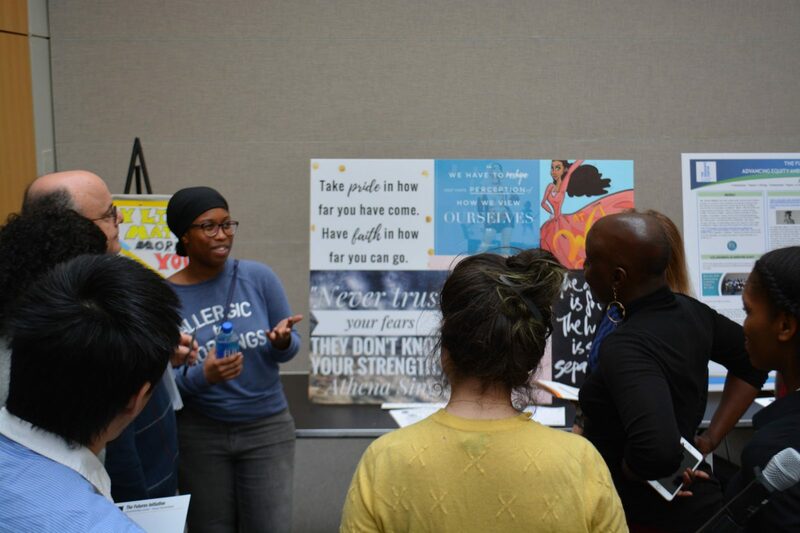 While many of them revealed that they didn’t know exactly what they were signing up for when they decided to take these courses, a notable thread among their reflections was an excitement about learning how to perceive themselves as experts in their own experiences and discovering strategies to bring their backgrounds, community work, and activism together as what fuels their research. 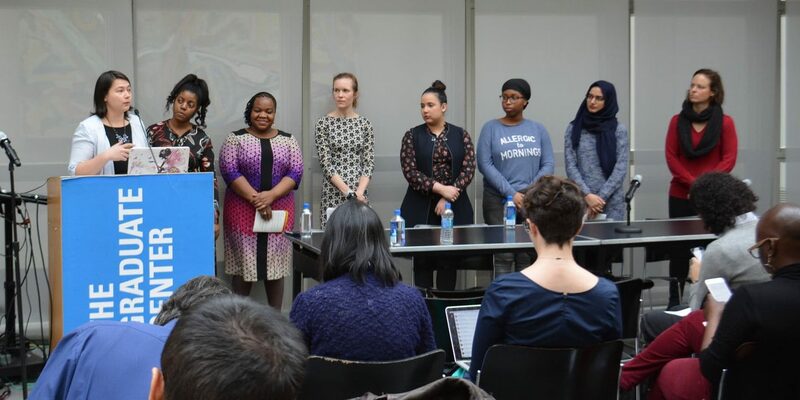 Following these remarks, students from each course shared a project that was developed out of their engagement with the broader thematic concerns, ideas, and questions they discussed in their respective classes. 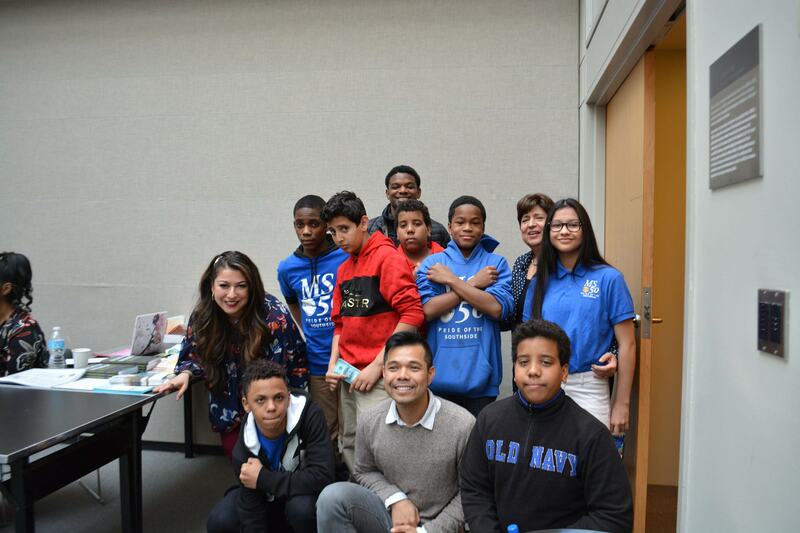 Khanh Le organized students from El Puente Middle School to do a multilingual spoken word performance on the importance of recognizing one’s bi- and multi-lingual identities both as a source of pride and strength and as a mode of collective resistance against labels and divisions. The audience broke out into applause after the students’ moving performance. 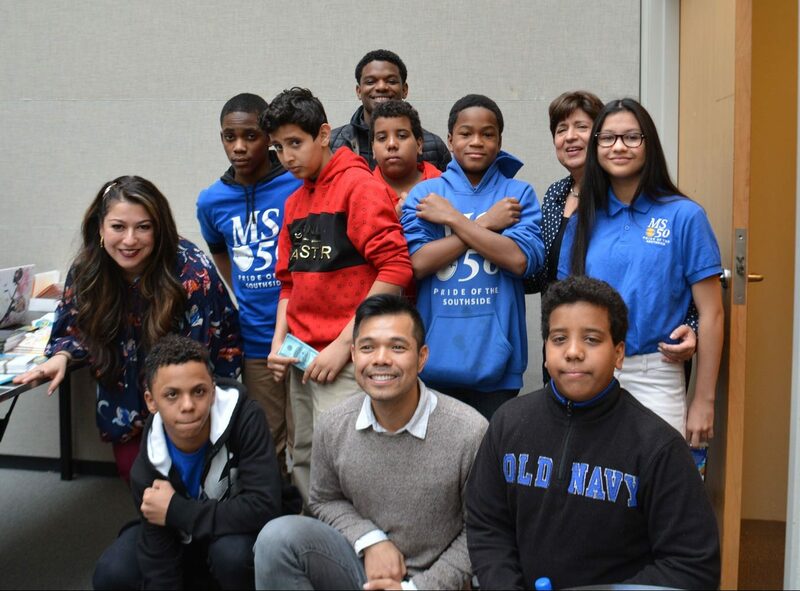 The students take a celebratory photo with their mentor Khanh Le and Professors Torres-Guevara and García. The students pose for a post-performance expression of pride and solidarity in their multilingual identities. 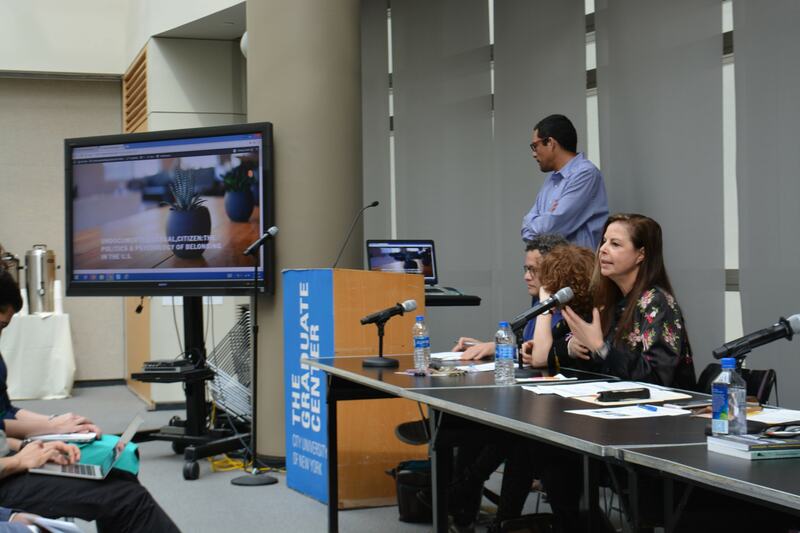 Sylvia Beltran and Michelle Gabay share the “Big Idea” project they developed, a website called “Reach the People,” which is animated by a mission to radically reimagine teacher preparation programs. Read more about the core values of this project here. 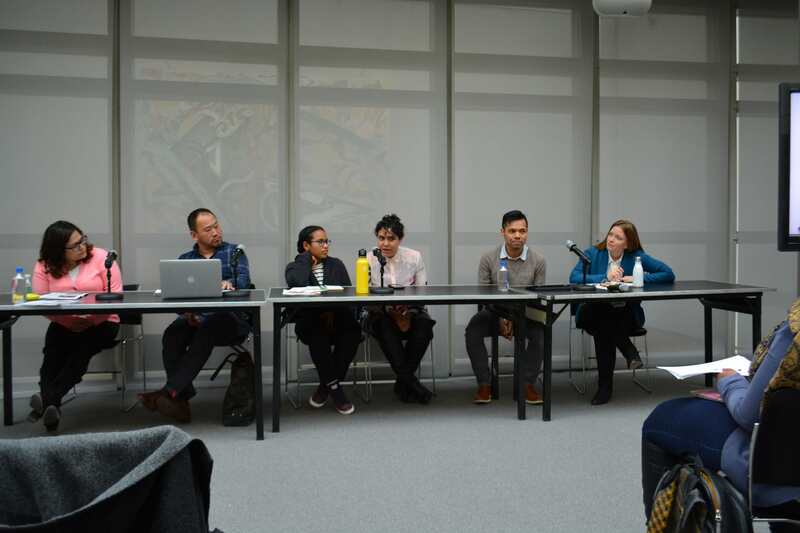 Larry Ling-Hsuan Tung and Samina Shahidi share their thoughts on the corporatization of the university and the projects they developed about “Press Freedom on Campus” and the “Sanctuary Campus Movement,” to illustrate alternatives to oppressive neoliberal conditions. 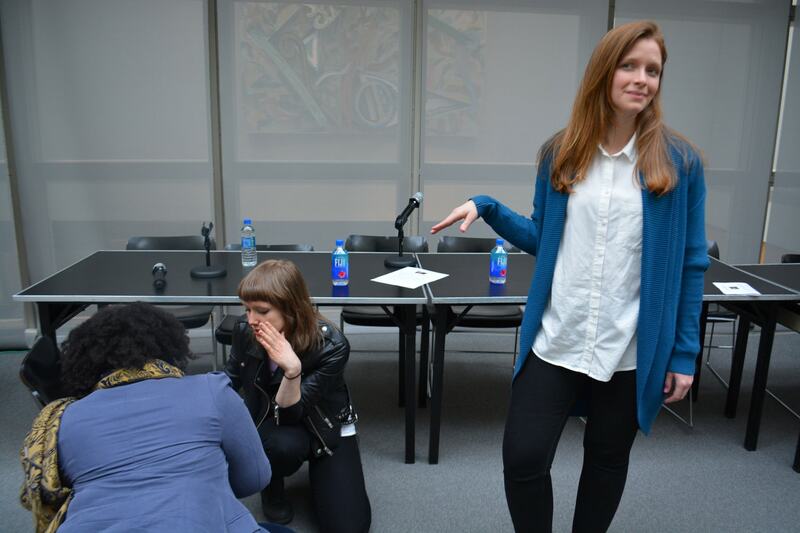 During this lunch session, graduate students from the course “Public School: Art in the City” conducted a performance piece to highlight the value hierarchies that organize the academy. They rearranged the structure of the Skylight Room into different seating areas and used color-coded stickers to identify audience members according to institutional rank and payscale. 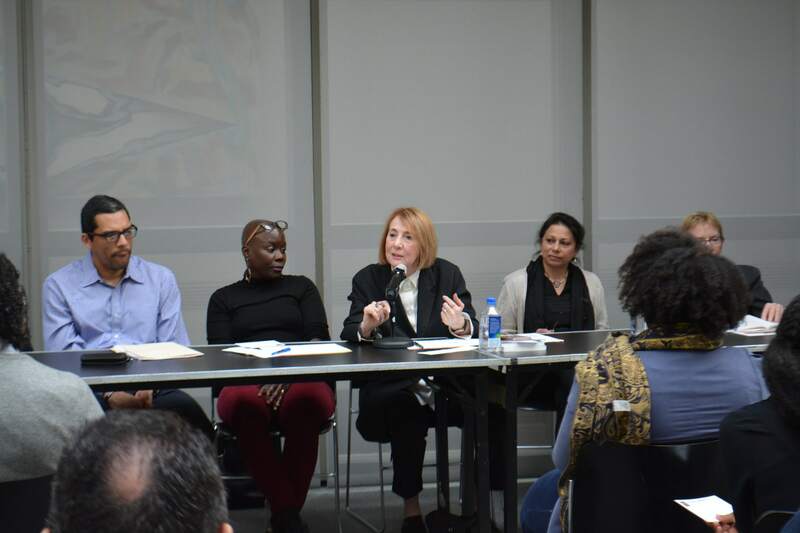 By compelling attendees to sit in their designated areas, they forced us to recognize the sharp divisions within the university among administrators, faculty, and students as we tried to speak with our colleagues across the gaps dividing these defined spaces. At the same time, this social experiment demanded that we attend to those absent from the circles and seating areas as well, including restaurant workers and maintenance, A/V, and facilities staff members who helped organize and set up the room in the first place. 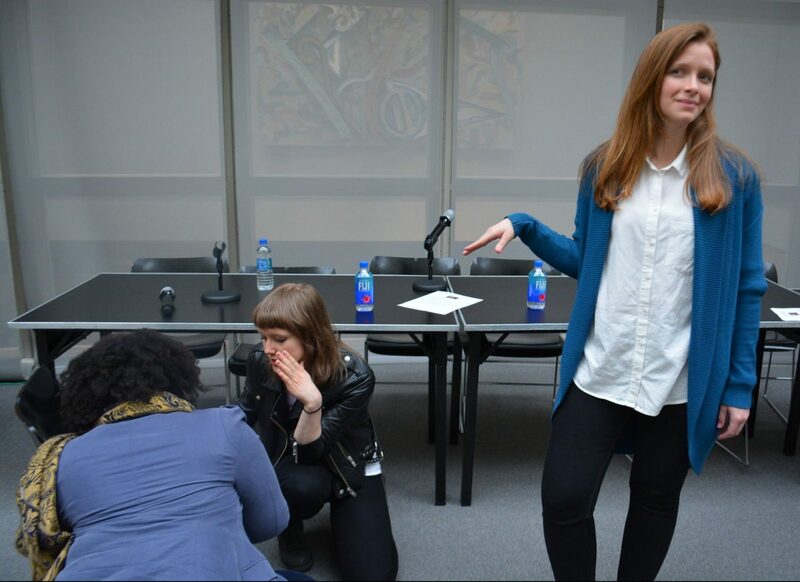 This collective performance captured the main concerns the “Public School” course grappled with around what constitutes “public” space, where one can claim a seat, and the hierarchies and divisions that structure our everyday lives. 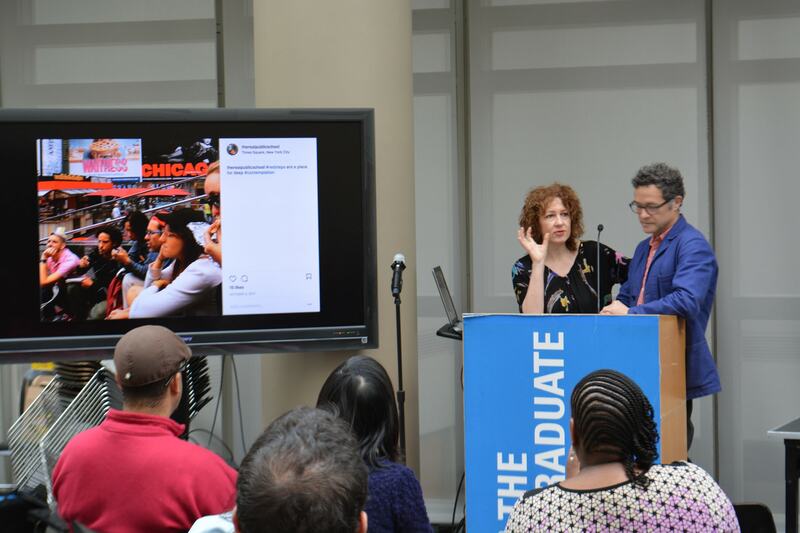 The session also featured a slideshow of the public Instagram account (TheRealPublicSchool) the class used to showcase the work they did during the Fall 2017 semester in various sites around New York City. 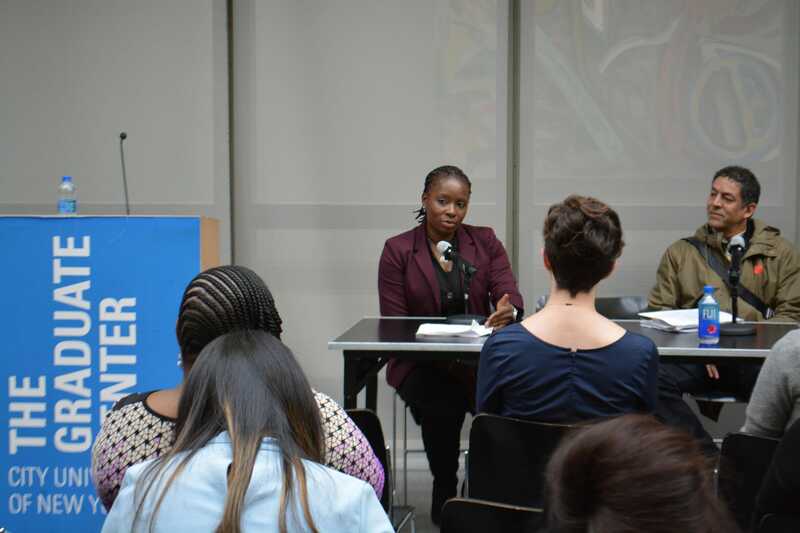 This session featured students involved in the CUNY Undergraduate Leadership Program and the CUNY Humanities Alliance. It was facilitated by Lauren Melendez, F.I. 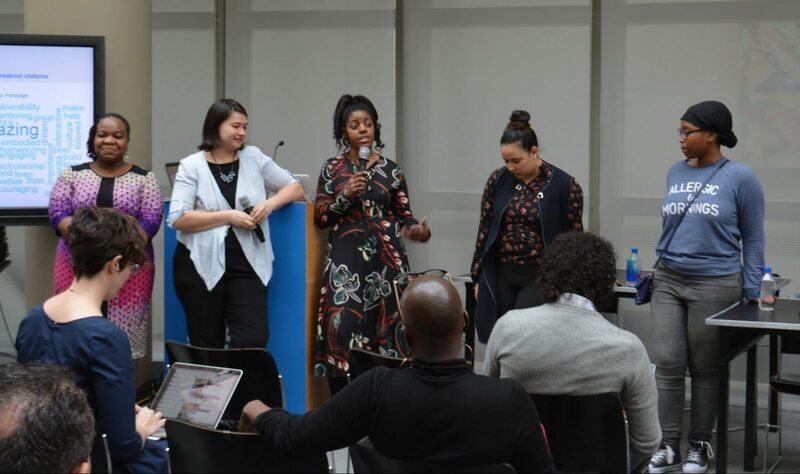 Undergraduate Peer Mentoring Director and Administrative Specialist, and Kaysi Holman, Director of Programs and Administration of the CUNY Humanities Alliance. 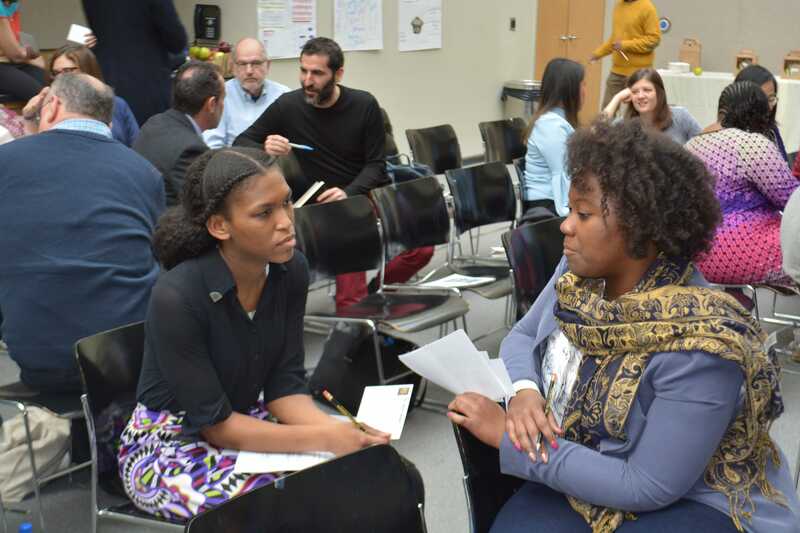 The session was comprised of a series of breakout stations led by student representatives from each program. 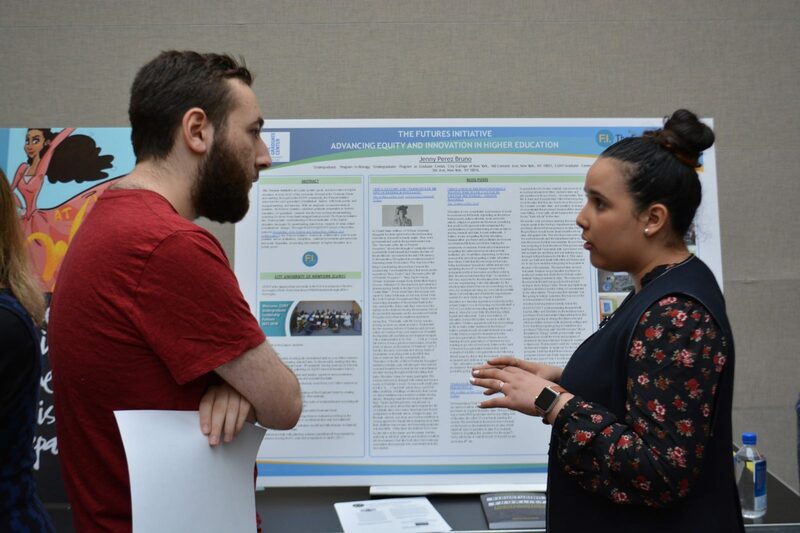 Station 1: Futures Initiative Leadership Fellows, Jenny Bruno and Alexis Paulin-Edwards, shared posters reflecting their experiences within the CUNY Undergraduate Leadership Program. 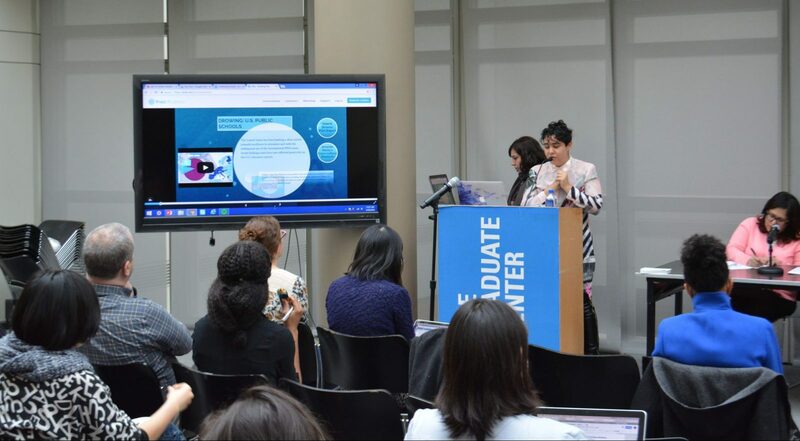 A key focus of their presentations were the blog posts they have written about the challenges they encountered as CUNY students as well as how participating in this peer community helped them take control of their learning and realize their own self worth in the process. 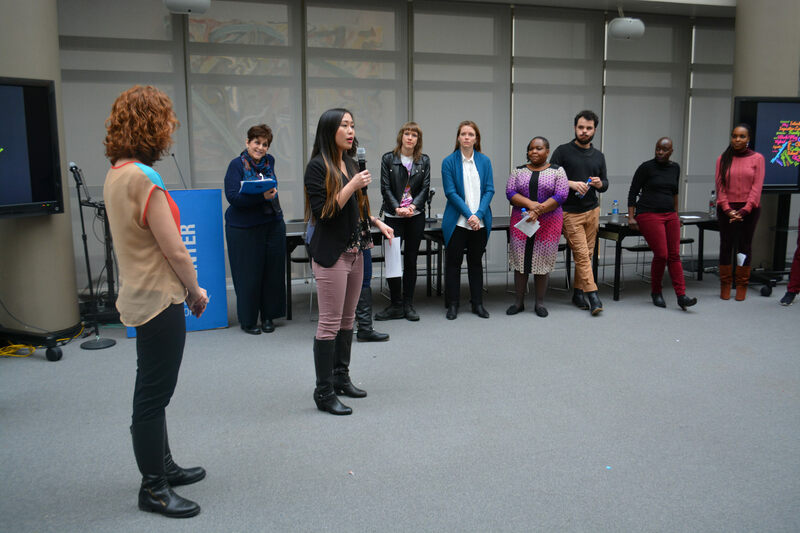 Jenny Bruno shares how her experiences as a CUNY Undergraduate Leadership Liaison taught her how to speak up in class to advocate for a more flexible and understanding classroom dynamic. 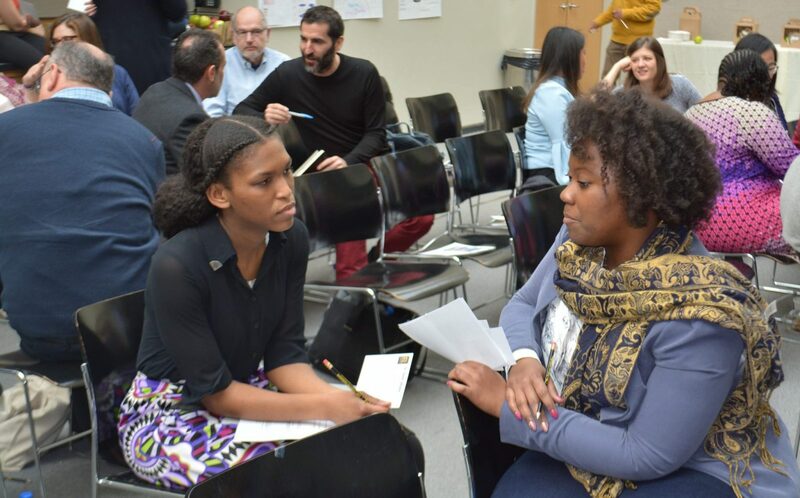 Alexis Paulin-Edwards talks about how the CUNY Undergraduate Leadership program helped her find confidence in her identity and exposed her to the possibilities of graduate education. 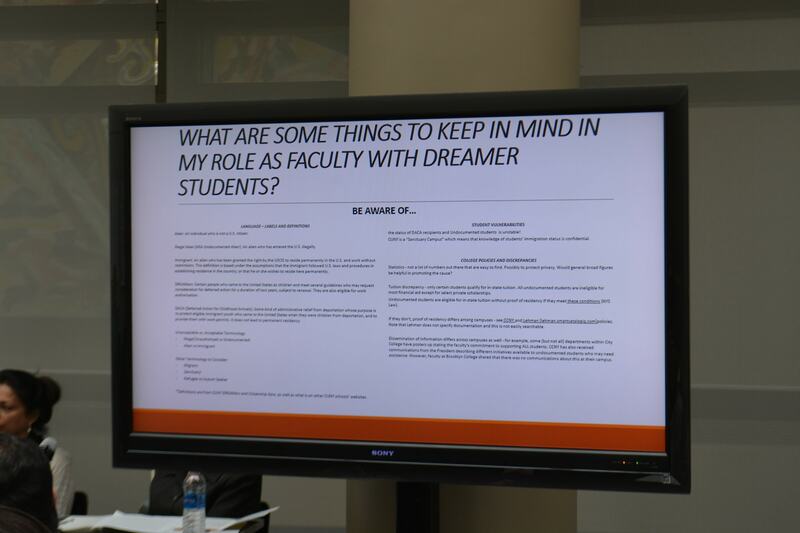 Station 2: Humanities Alliance Fellow, Allison Walls, shared a word association activity that she uses in her teaching and methods to get students to stop thinking about institutional restrictions like grading that limit their creativity and their voices. 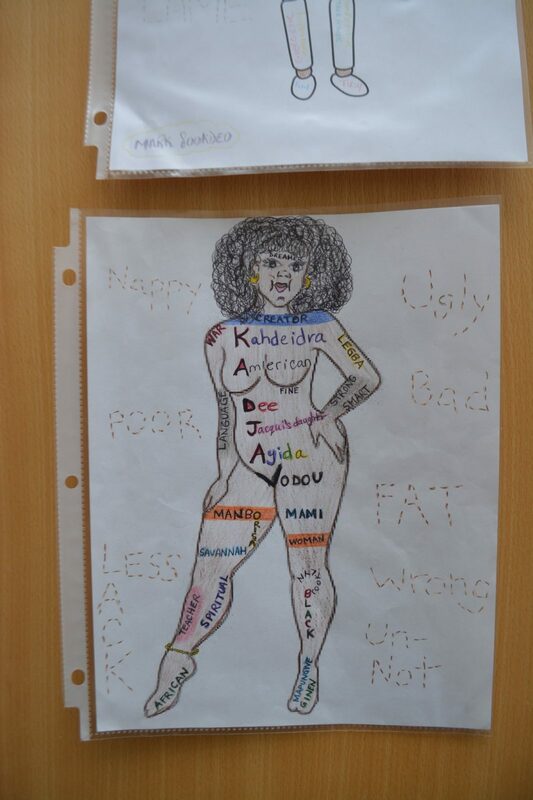 Station 3: Humanities Alliance Fellow, Kahdeidra Monét Martin, shared her teaching strategies, which rely on word clouds, tactile objects to introduce elements of the short story, and drawing exercises that invite students to embrace their own bodies and differences to produce a healthy self image. A close up of the short story goodies that Kahdeidra shared with the audience. Station 4: Kaysi Holman and Lauren Melendez answer questions about their respective programs. 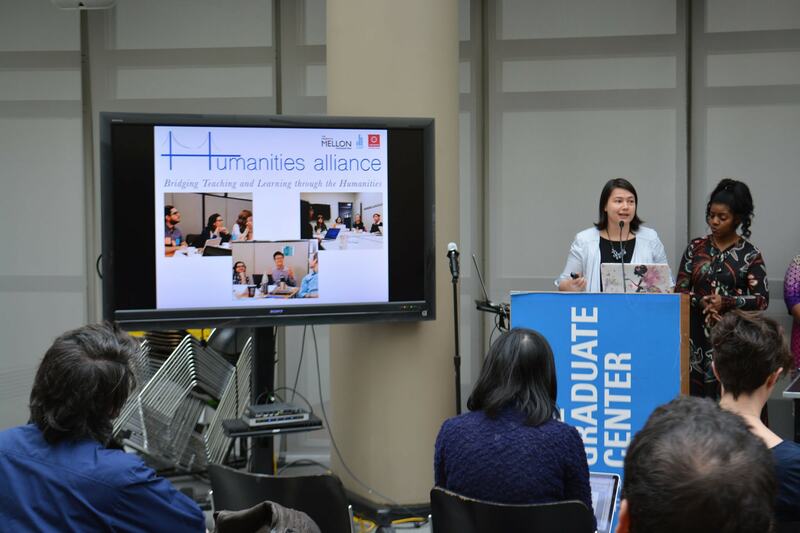 Kaysi Holman discusses the motives behind the CUNY Humanities Alliance and its efforts to connect graduate education with community college teaching and learning. 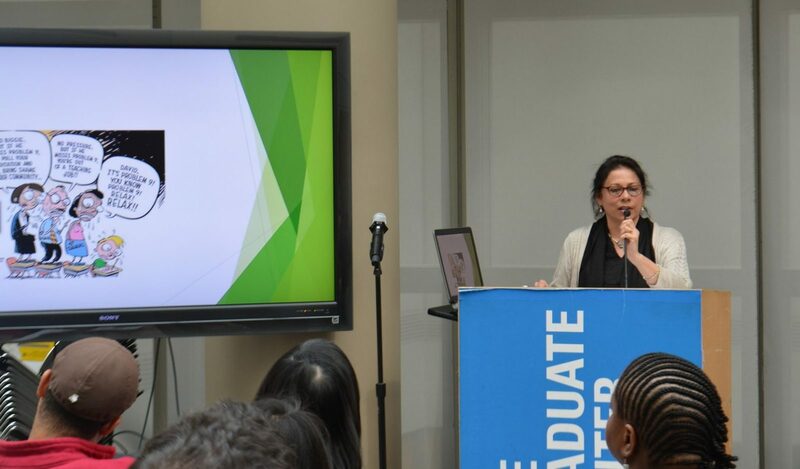 Lauren Melendez discusses both the possibilities and challenges of directing a program like the CUNY Undergraduate Leadership Fellows, including her hopes of expanding its reach whiles also giving students a close-knit community for support and peer mentorship. 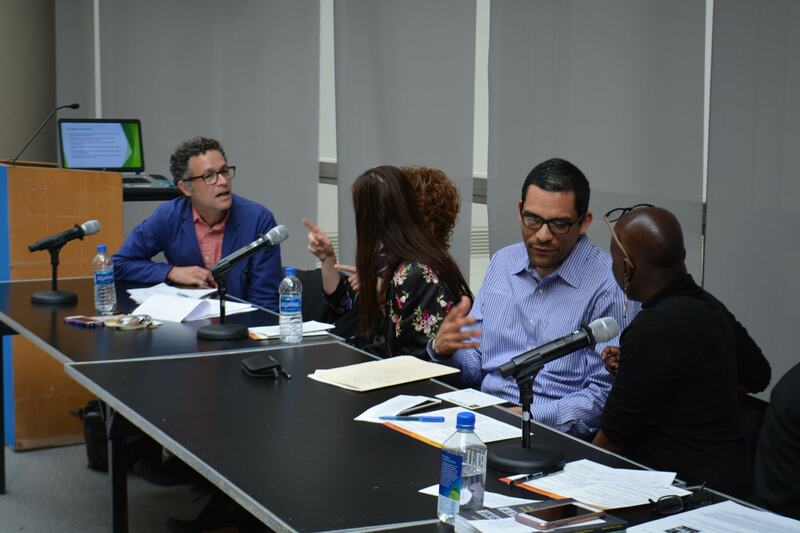 This faculty roundtable featured Claire Bishop and Paul Ramírez Jonas, who co-taught “Public School: Art in the City,” Colette Daiute and David Caicedo, who collaborated on the course “Undocumented, Illegal, Citizen: The Politics and Psychology of Belonging in the United States,” Cathy N. Davidson and Shelly Eversley, who are co-teaching “Black Listed: African American Writers and the Cold War Politics of Integration, Surveillance, Censorship, and Publication,” and Wendy Luttrell and Amita Gupta, who are team-teaching “Critical Perspectives on Childhood Pedagogy” this spring. 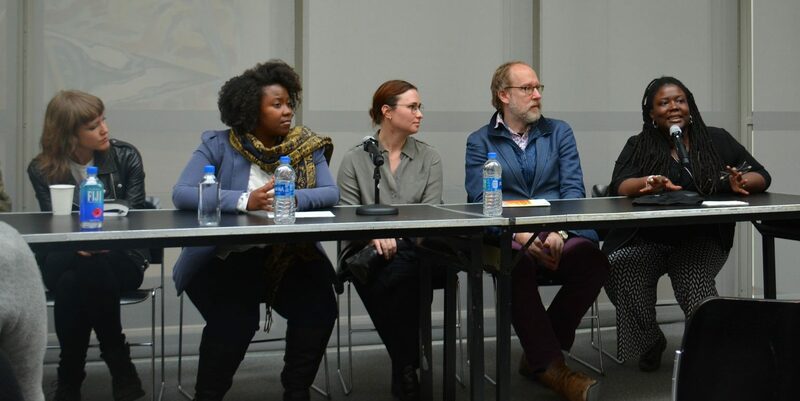 The panel opened with each faculty pair sharing a transformative moment in their teaching. 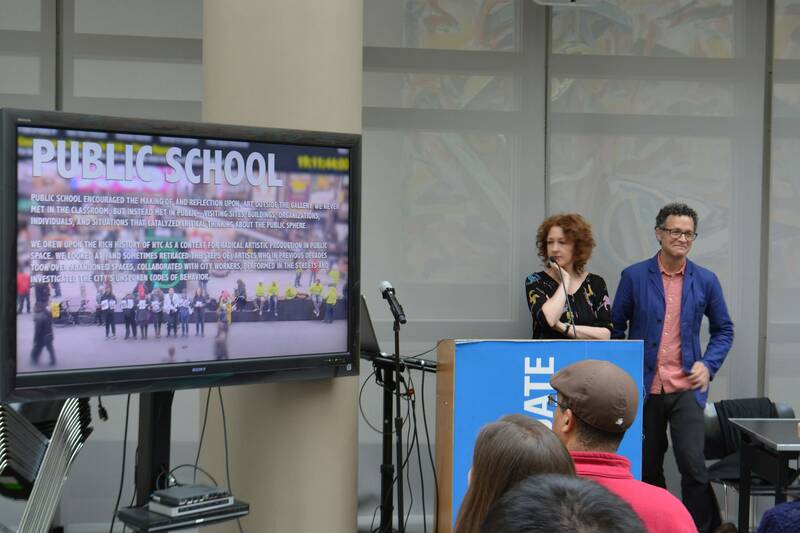 We saw a beautiful video edited by Paul Ramírez Jonas that captures the various journeys that he, Claire Bishop, and their students took all over the city, from the Bronx supreme court and the Queens Museum to the Park Avenue Armory and Times Square. 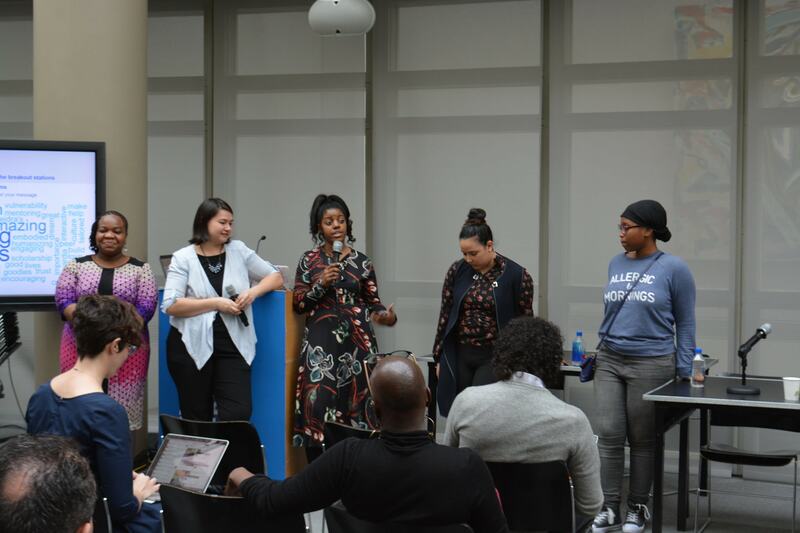 We heard about the challenges they encountered in trying to find an adequate setting for their classes and their efforts to create space for learning in privately owned public spaces. Claire Bishiop and Paul Ramírez Jonas share photos from the Instagram account (TheRealPublicSchool) their class used to document their adventures throughout New York City. 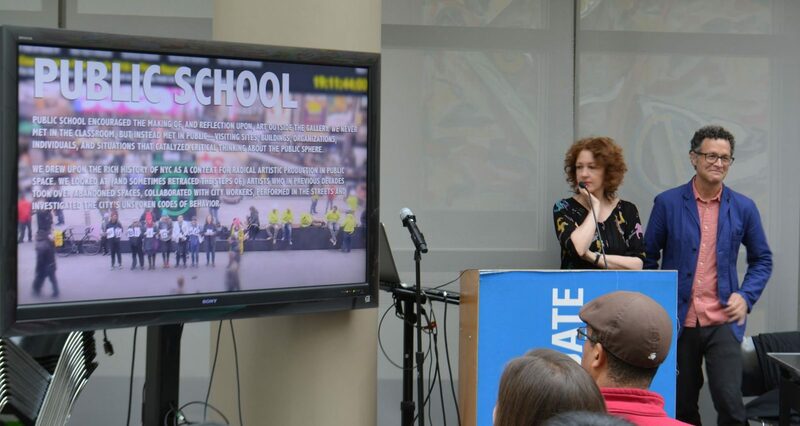 A viewing of the video Paul Ramírez Jonas created to capture the students’ final project: a manifesto on the meaning of public art. 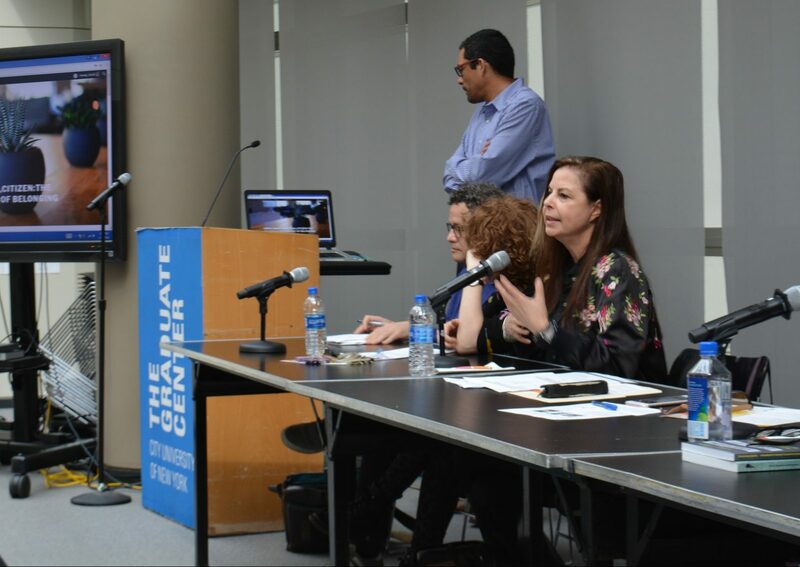 We heard from Colette Daiute and David Caicedo how transformative it was to have representatives from the CUNY DREAMers visit their class, for their students to listen and learn from the stories these individuals shared about what it is like to be undocumented in the CUNY system, which raised the stakes of their discussions about sanctuary movements. Colette Daiute discusses how she and David Caicedo brought the public into their classroom in a variety of ways: "One was with visitors from community organizations… But it also was to bring our own broader experiences into the issues of what it means to be a citizen, what it means to be undocumented, what it might mean to be illegal." 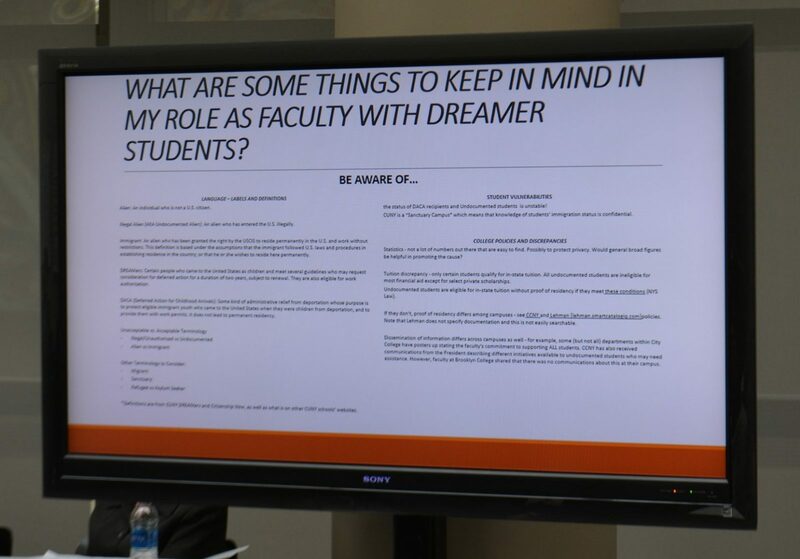 A snapshot of a draft of David Caicedo’s PowerPoint presentation, which details a draft brochure the class created to bring awareness about how faculty and administrators can support immigrant students. 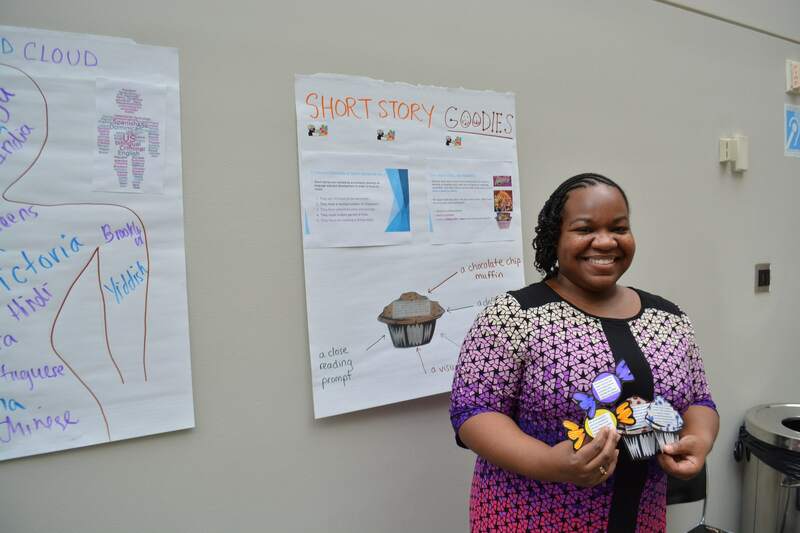 We learned from Cathy N. Davidson and Shelly Eversley how a classroom can be transformed if you let students take control of their education by crowdsourcing a syllabus and sharing the pedagogies they use in their undergraduate teaching. 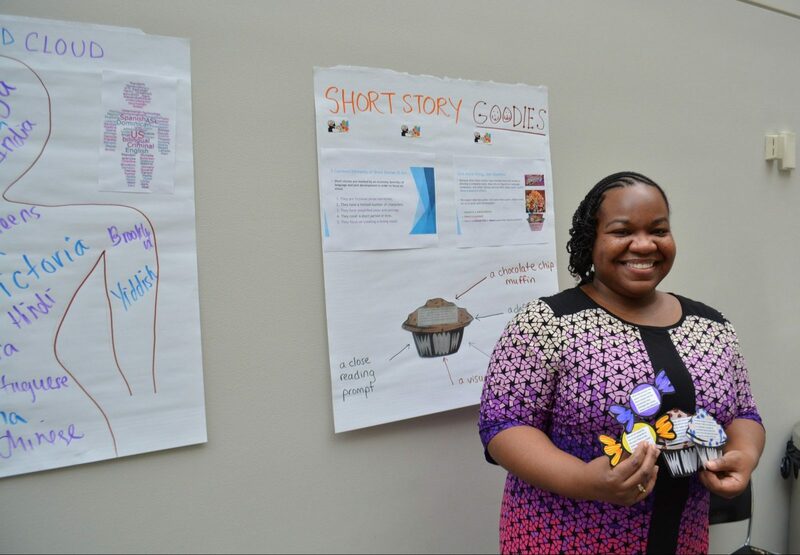 We heard Davidson and Eversley’s reflections on how much they learned from the activities, resources, and skills their students brought into the course. 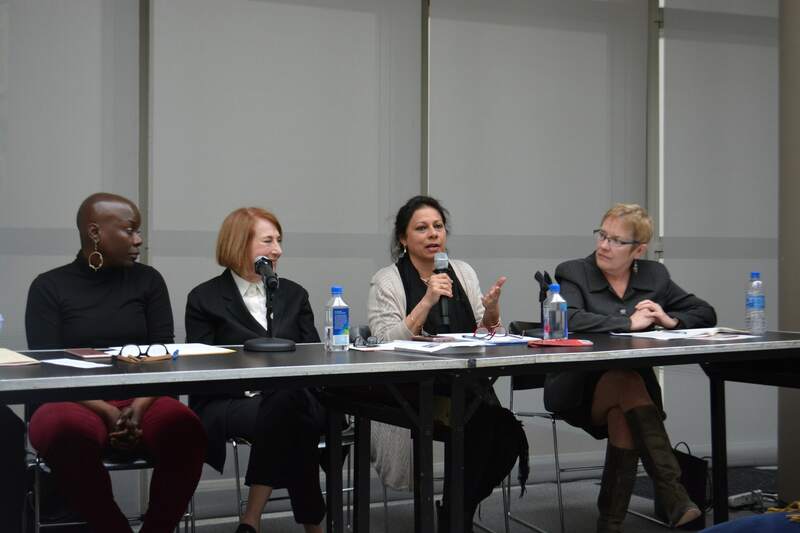 We thought with Wendy Luttrell and Amita Gupta about the BIG questions their class has been grappling with, from the colonial legacies of education to the rigid constructions of adult-child relationships in the American school systems. We also reflected on the possibility of hybrid third spaces in classrooms and how they might be created and facilitated by socially engaged teaching practices. 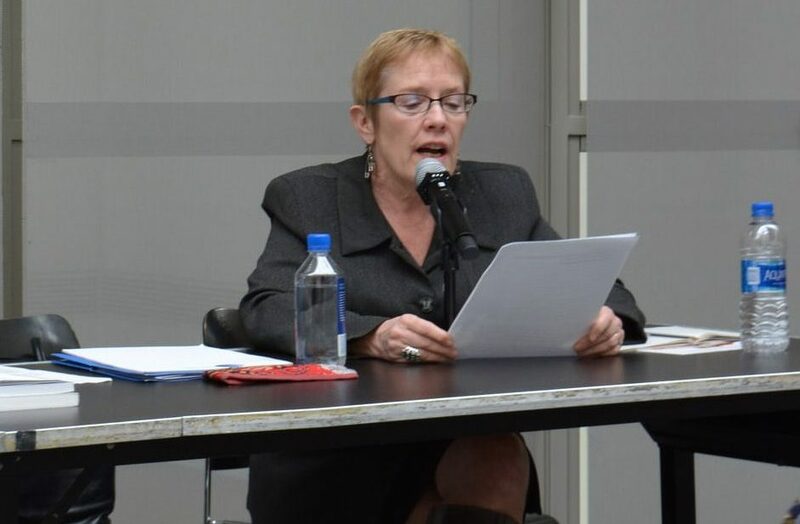 Wendy Luttrell reads a moving anecdote about violence and inequality in public schools. 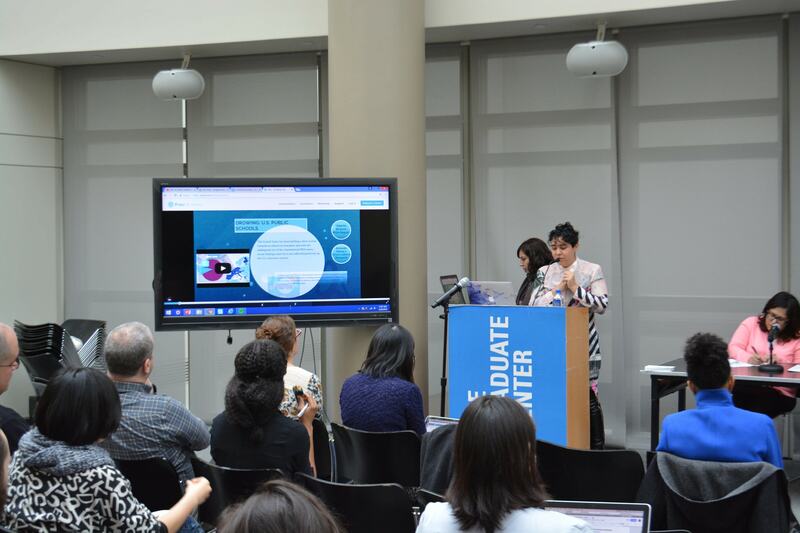 Amita Gupta shares a PowerPoint presentation that details the overarching questions that animate the class as well as students’ final project ideas. 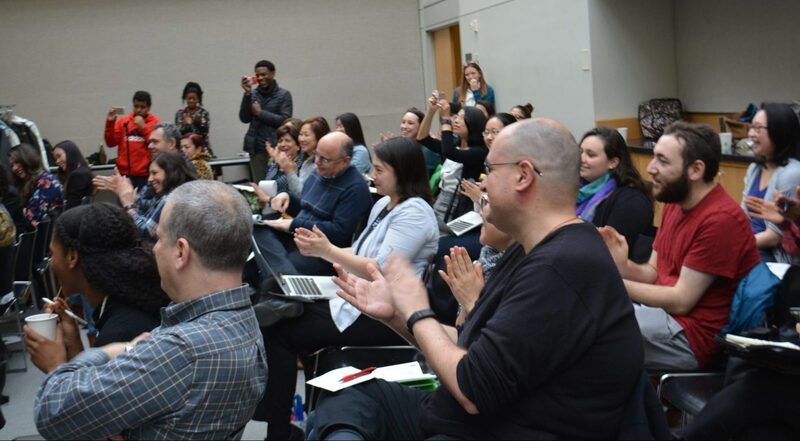 Following each faculty pair's presentations about their respective class, Davidson led the audience in a think-pair-share activity, inviting all of us to consider a transformative moment in our own education or teaching. 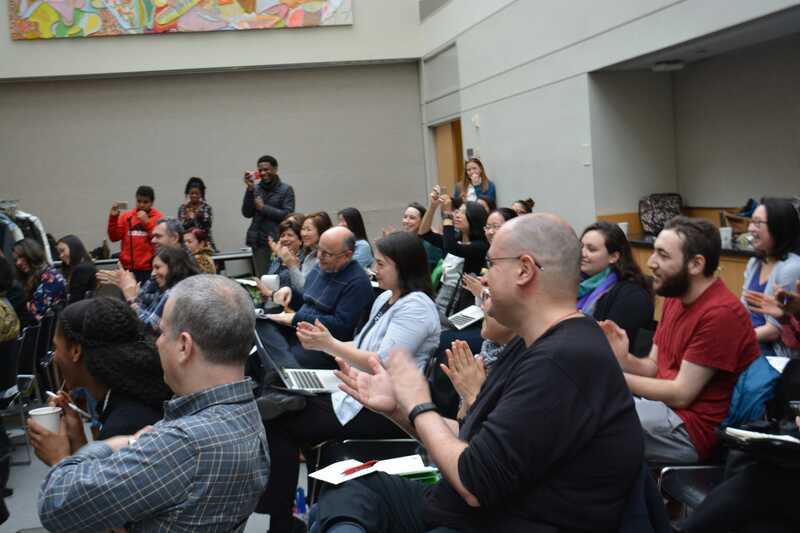 The entire audience breaks out into discussion to share their transformative educational or teaching moments. 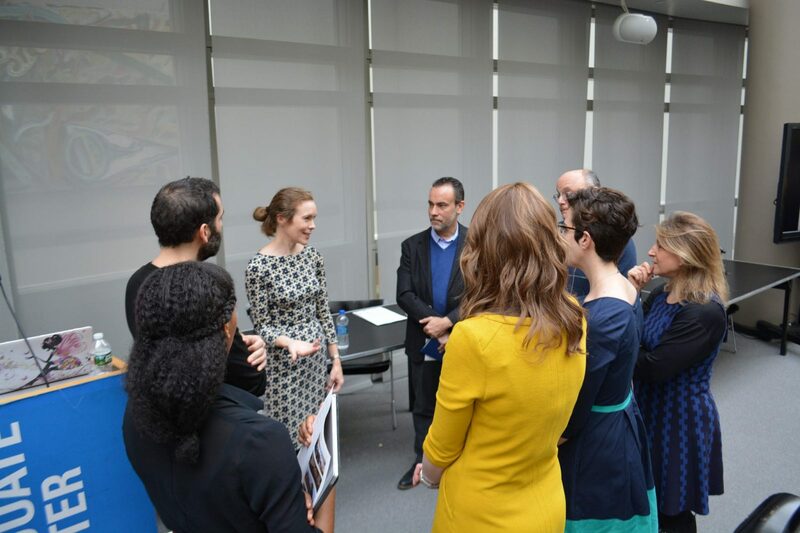 The panel also participates in this think-pair-share activity. 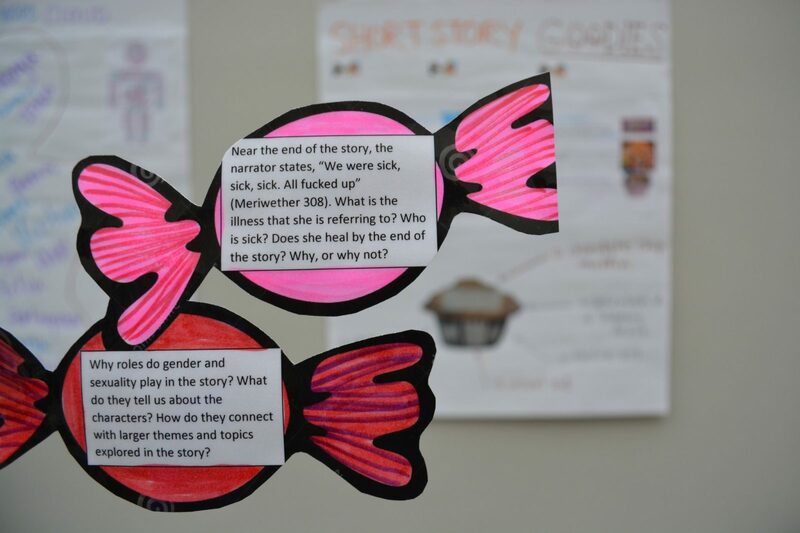 The think-pair-share prompt encouraged deep, focused conversation in small groups. 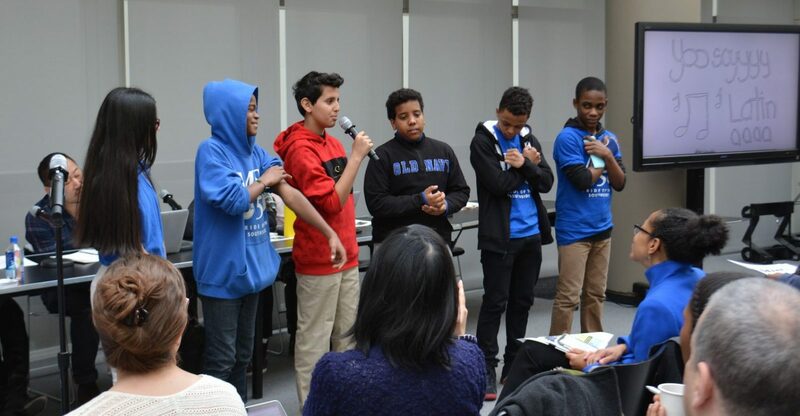 It was a perfect display of how total participation acknowledges all voices and perspectives. 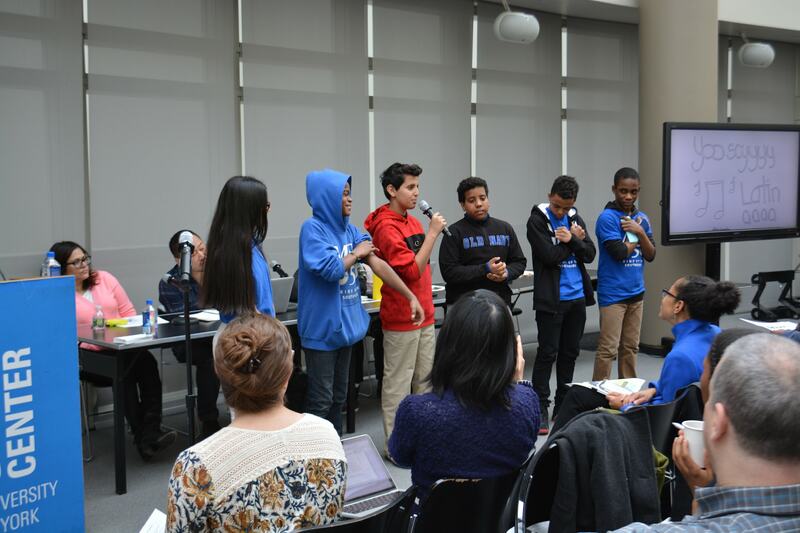 This session featured students from the following F.I. 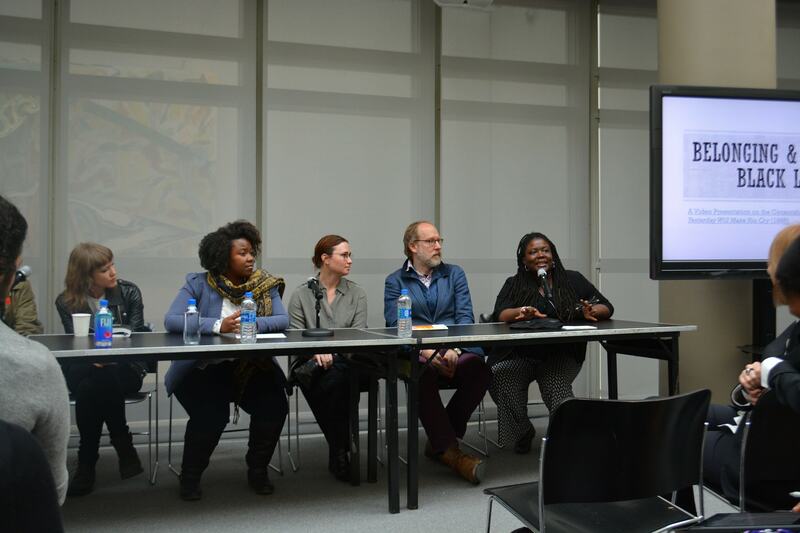 team-taught courses: “Undocumented, Illegal, Citizen,” “Black Listed,” and “Critical Perspectives in Childhood and Pedagogy.” The panel was moderated by F.I. graduate fellows Kashema Hutchinson, Allison Guess, and Jessica Murray. 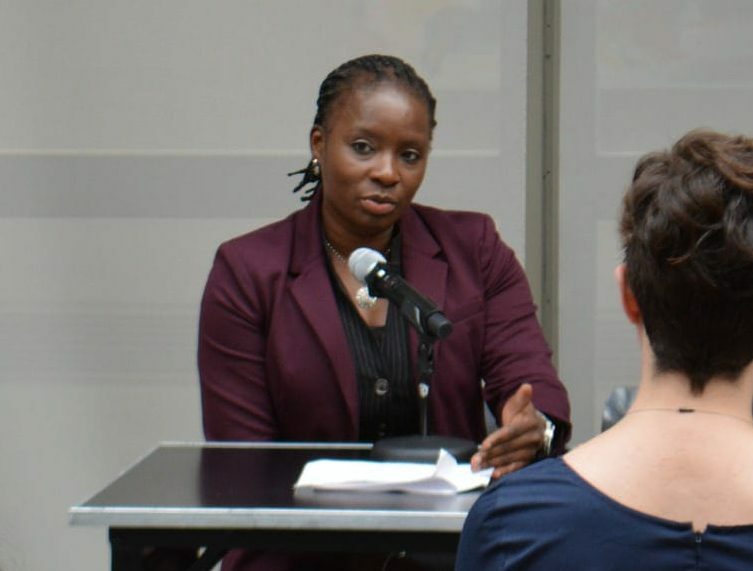 Aminata Diop, who took Colette Daiute and David Caicedo’s “Undocumented, Illegal, Citizen: The Politics and Psychology of Belonging and Exclusion” course, shared the story of an immigrant student. It was a moving narrative about a woman’s journey from Mexico. This story captured one person’s struggles with inequity, homelessness, and more, yet it was filled with hope and affirmation about the important role that education and student organizations have had in providing a source of comfort, community, and solidarity. Daniel A. Carlson, Damele E. Collier, Flora de Tournay, Kayla F. Morse, Charlene Obernauer, and Luis Zambrano, from Cathy N. Davidson and Shelly Eversley's "Black Listed" course, shared a video created by student and professional musician and videographer Daniel Carlson, with voice overs from other classmates. Dan used stop motion animation to detail the censorship of Chester Himes’s novel, Yesterday Will Make You Cry. 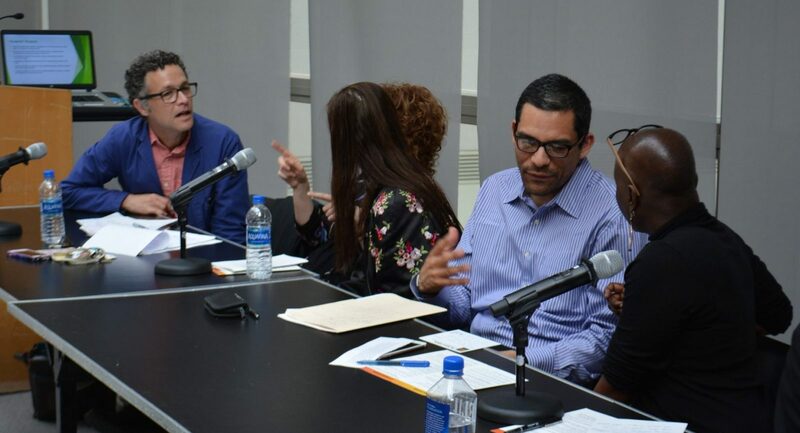 Witnessing the blacking out of Himes’s writing, accompanied by the chilling sounds of erasure and the over-writing of his work underscores the violence of this process, which one student described as the effective removal of the soul of the novel. 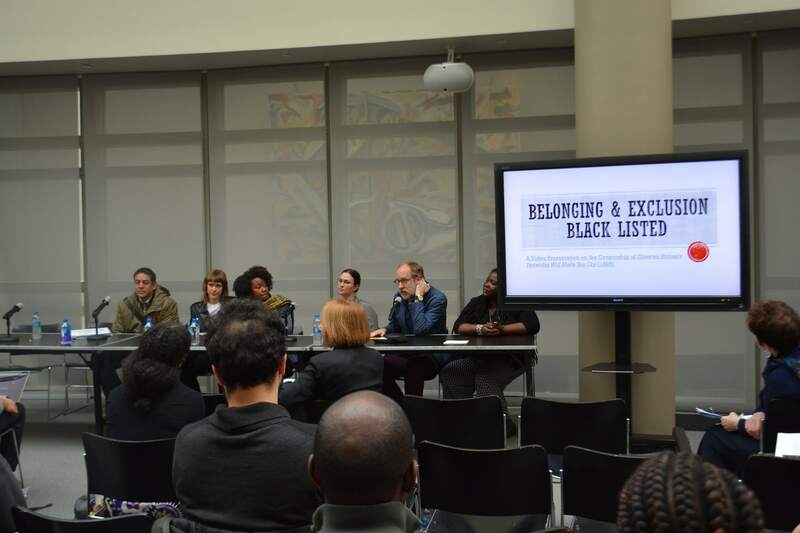 To follow the development of this course, check out the public group for “Black Listed” on the HASTAC website. 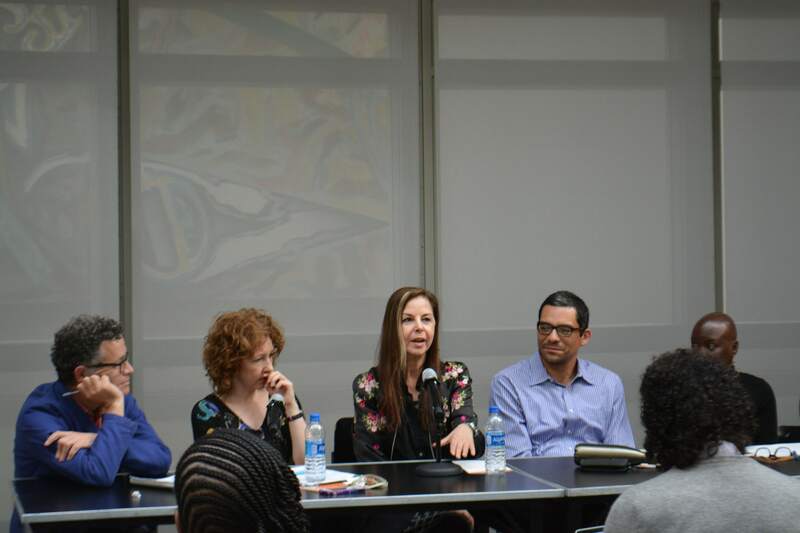 Charlene Obernauer discusses the impact of discovering the enormous differences between the 1992 and 1998 versions of Himes’s novel. Daniel A. Carlson explains how he created the video using stop-motion animation. 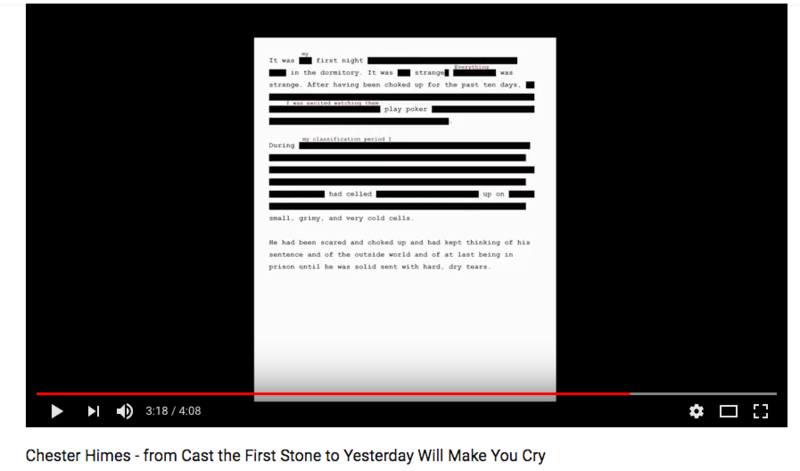 A close-up of the video created by Daniel A. Carlson, which features the literal blacking out of Chester Himes’s writing. 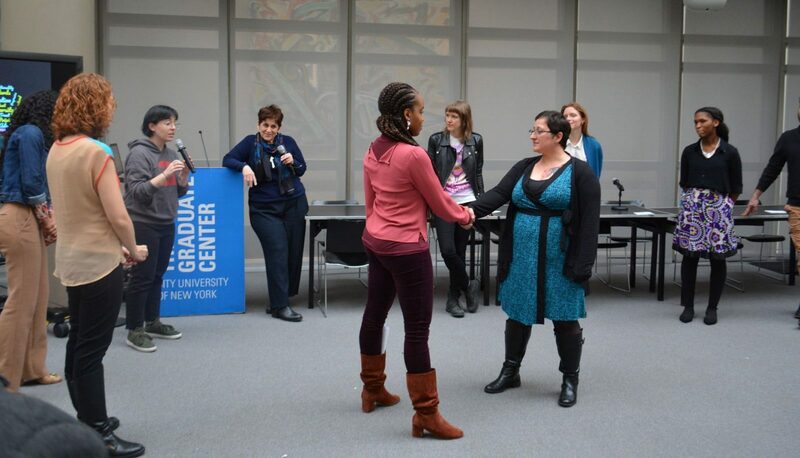 Francine Almash, Dahlia Constantine, Regina Crotser, Sudhashree Girmohanta, Jyoti Gupta, Doris Porto, and Ben Raphael, from the course "Critical Perspectives in Childhood and Pedagogy," led the audience in an exercise on embodied learning that draws strategies from Theater of the Oppressed. 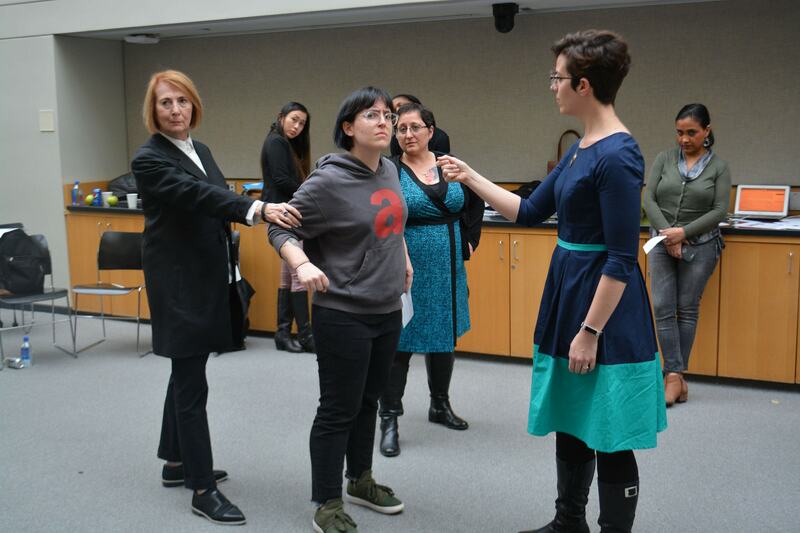 After rearranging the room and encouraging attendees to get comfortable with moving through the space, the graduate students taught us to how create tableaus with our bodies; they then invited us to observe physical details and interpret the power dynamics on display. 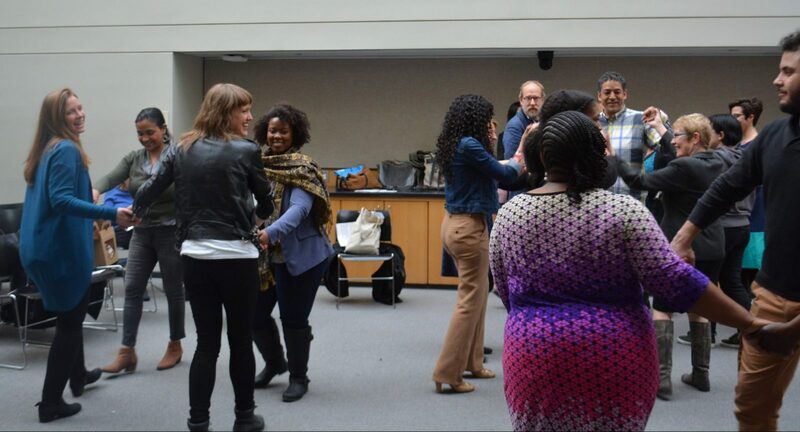 This exercise was a powerful example of engaged pedagogy that emphasizes total participation to assist us in recognizing racial/gender/generational hierarchies while also creating openings for us to think together about how we might unsettle, rearrange, and rehearse for social revolution. 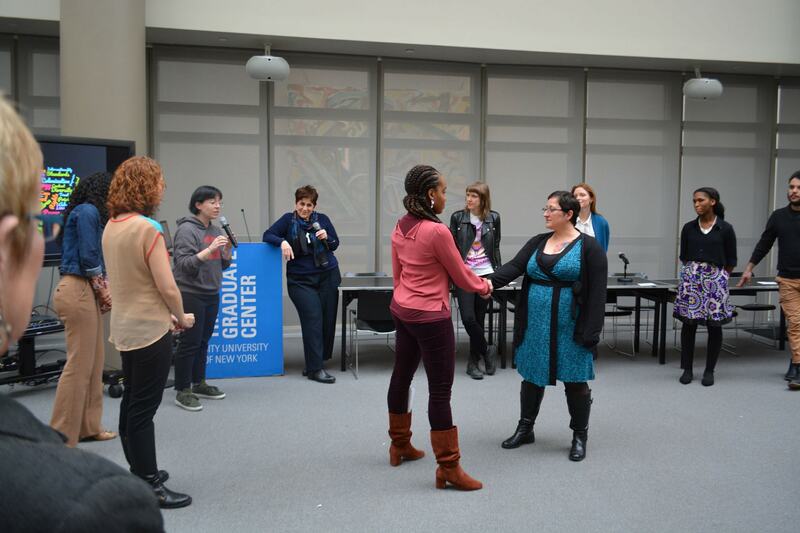 Doris Porto explains the inspiration behind this activity from the Theater of the Oppressed. 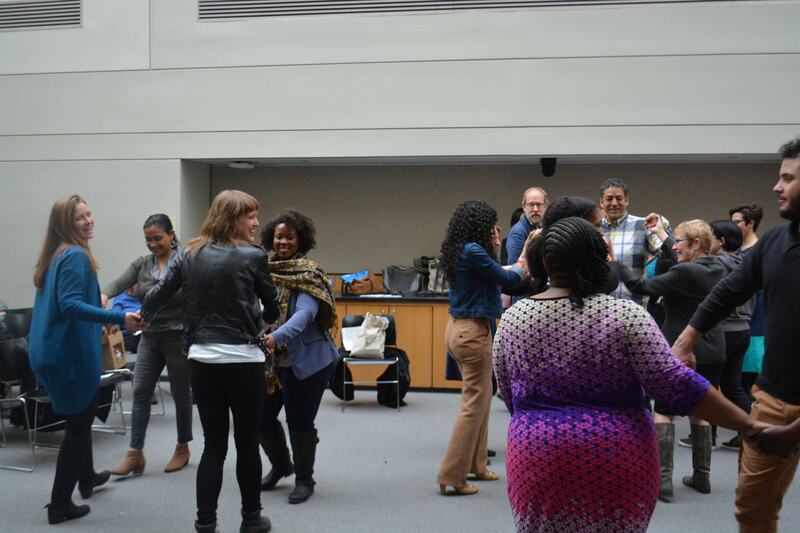 Participants were encouraged to learn how to move together through the room and to get comfortable in this space. Collective interpretation of the power hierarchies in this tableau. 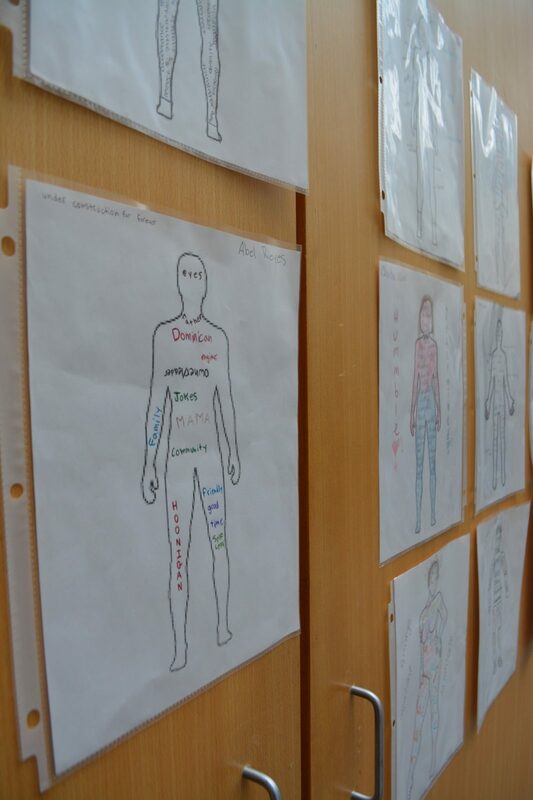 An example of a tableau depicting the power relations embedded in child-adult relationships. Another example of a tableau depicting the hierarchies that structure adult-child relationships. 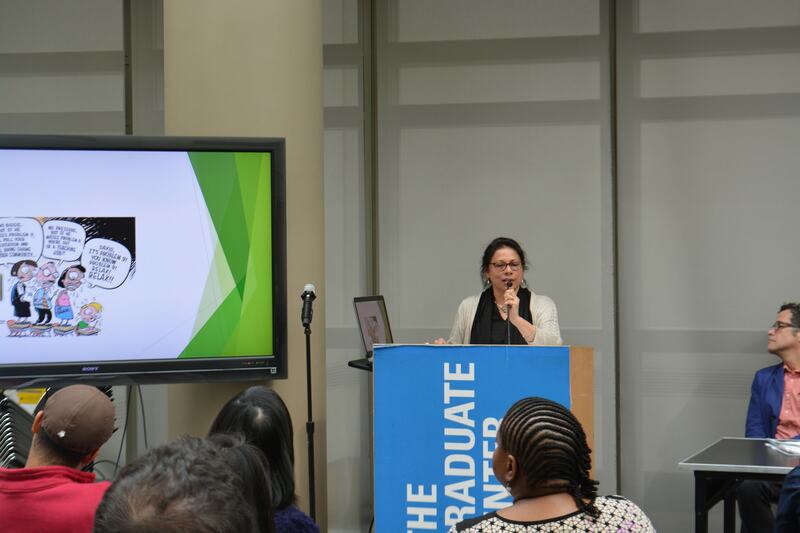 The forum ended with closing remarks and thank you’s by Frances Tran, Postdoctoral Fellow and Interim Associate Director of the Futures Initiative, and a reception to celebrate the end of a long, generative day.